This is an amazing 3.2 oz DT quartz from Brazil and is 2.5” by 1.4” by 1.9” with a very pale but warm smoky citrine color. Sides and faces are intricately glyphed but you will need a loupe to see them well … and they are amazing! She is rather triangular in shape with a multi lower termination partially covered with druse. You will also see an inset of mica at her upper termination. She is full of mystery and incredible information and will bring much joy and knowledge to her rightful Keeper! 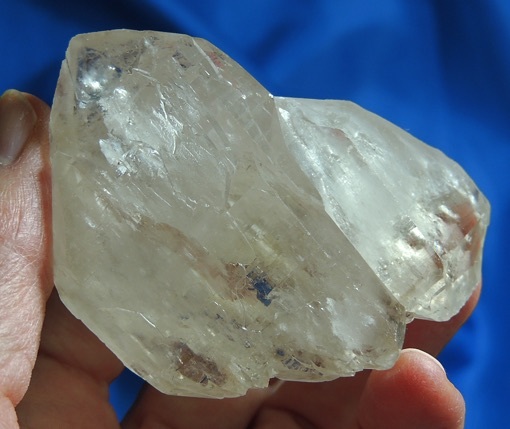 The ancient peoples sought crystals such as this because of the power they contained. Her glyphed faces and sides are keys to unlocking the secrets of the ancients. These unite her with the air and water; she is earth and fire. To work with this Spirit, gather other items of the earth: feathers, shells, flowers, herbs, small stones. Arrange them in a circle and orient them so that the four directions are honored. Anoint this Spirit with rainwater and allow her crystalline musk to rise. Play drumming music or drum yourself to heighten the vibrations of the meditation. She is a mystical crystal, holding the secrets within her. As you meditate, she will release them, one after another. Shamans cherished, honored and savored visions so received. These are now yours for your own Spiritual advancement as well as others who look to you for Light.